When Lefty’s husband was diagnosed with diabetes, their home turned upside-down trying to find various ways to avoid grains which caused his blood sugar to spike. He wasn’t a fan of “health food” but she talked him into going grain free mostly by ditching grains herself. As the chief cook of their home, she felt a pressing responsibility to create dishes that he could enjoy with added health benefits for him. We created a twist on an ancient classic but using cauliflower “rice” in place of bulghur wheat. With so many allergic to wheat now, if you still would like to have the more filling grain without losing the texture, you can substitute an equal amount of steamed quinoa (red or white) for the cauliflower. 1. In a Ninja or food processor take several cauliflower florets and whizz until they look uniformly riced. 2. Chop parsley and mint and blend together. 5. Juice the lemon (1/4 cup) and add to olive oil. Add salt and cayenne and whisk together. Pour over mixture until well blended. Enjoy within three or four days. Use as a filling in pitas, or use as a side salad. 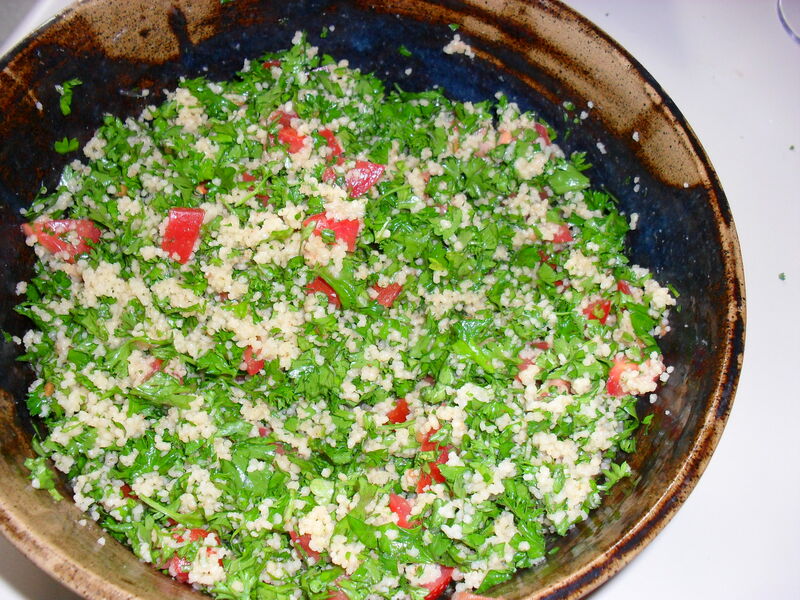 One of our favorites is to spread with hummus dip and add this tabouli. The hummus compliments and helps keep the tabouleh in the sandwich.